Would you make a good computer repair technician? Take our career test to find out how you match with this and over 800 other careers. What is the workplace of a Computer Repair Technician like? 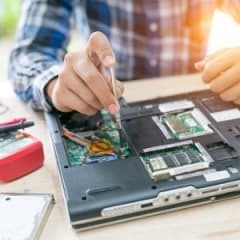 A computer repair technician is someone who installs, analyzes, repairs and maintains many different types of computer equipment, or may specialize in working on networks or servers. Technology is continually evolving, therefore the technician has to keep up to date in order for him be able to analyze and troubleshoot each specific job. Computer repair technicians take malfunctioning computer hardware and software, then perform the necessary steps to diagnose and ensure the systems are returned to a usable state. Technicians also build and assemble personal computers and servers, and may set up local area networks of computers and other related devices. Computer repair technicians mainly deal with the hardware components of a computer, but sometimes are called upon to install or replace drives, memory, and cards. A computer repair technician may be required to build a system from components and load the operating system software on to the hard disk. He will then locate and install the necessary programs, called drivers, that allow the operating system software to work with the hardware. A computer repair technician will also work with the software of computers. This is usually the operating system software. Computers may get viruses or other malware infections, and a computer repair technician may be called upon to remove the offending programs. If the operating system software doesn't function and cannot be repaired, the technician will usually back up the user's data if possible, and format the hard disk with a new copy of the operating system. Are you suited to be a computer repair technician? Computer repair technicians have distinct personalities. They tend to be investigative individuals, which means they’re intellectual, introspective, and inquisitive. They are curious, methodical, rational, analytical, and logical. Some of them are also conventional, meaning they’re conscientious and conservative. Does this sound like you? Take our free career test to find out if becoming a computer repair technician is right for you. Computer repair technicians usually work in store front shops, corporate information technology departments, government offices and hospitals among other places. These places tend to be well lit and climate controlled offices or store front work bench areas. Technicians may also be required to perform their repairs on-site in a number of different environments including industrial settings, commercial offices or residences. Many experienced computer repair technicians may work freelance, or as consultants, and operate out of a home office and go on-site for their clients.